Scored and folded my white cardstock to create my easel structure. 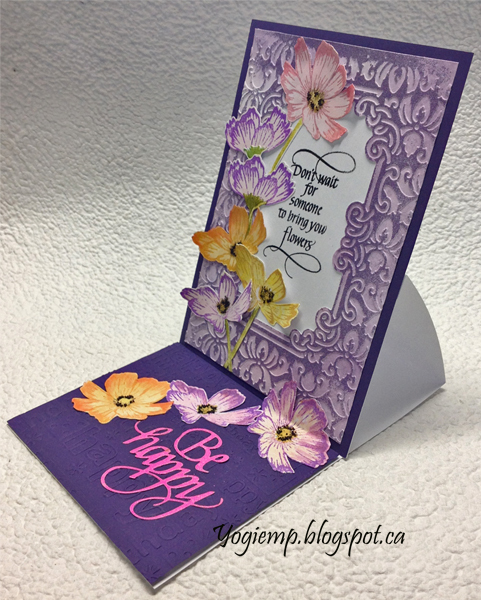 Cut another piece in dark purple the same size as card and adhered to front. 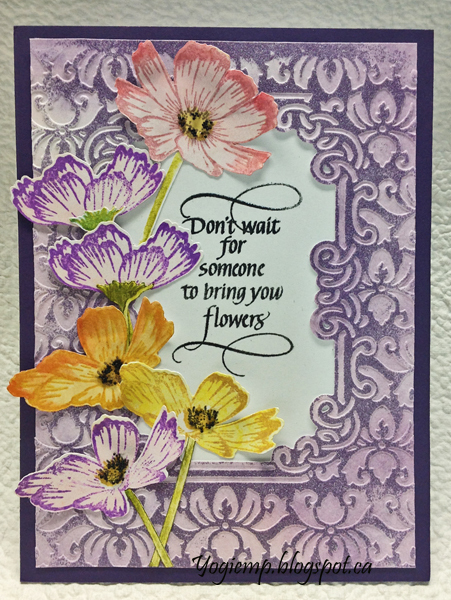 The cut and embossed background is Cuttlebug "Brocade Window" on the reverse side, inked all over with Distress "Vintage Rose", dried, then hit the high points with Versamark and embossed with a glittery embossing powder. Stamped the quote on white cardstock with Versafine Black Onyx and clear embossed. Adhered to brocade piece then to front front of card. 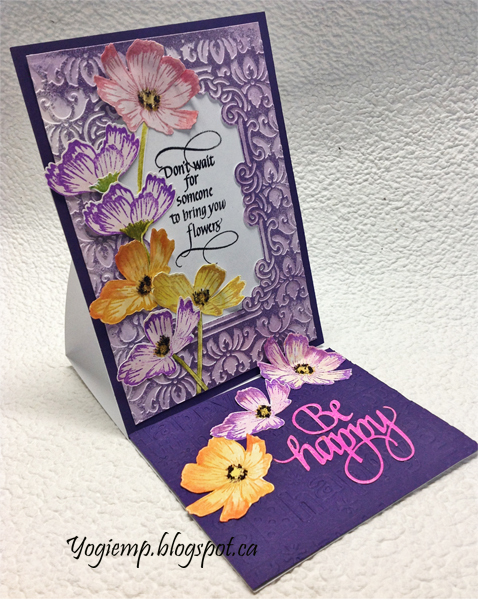 Created a silhouette image of each base flower from the stamp set (AlteNew "Stunning Cosmos"). Cut with my electronic cutter from white cardstock. Stamped each as per the instructions using Distress regular and Oxide pads. In the centers added some glue and dropped in some dark brown holeless beads. 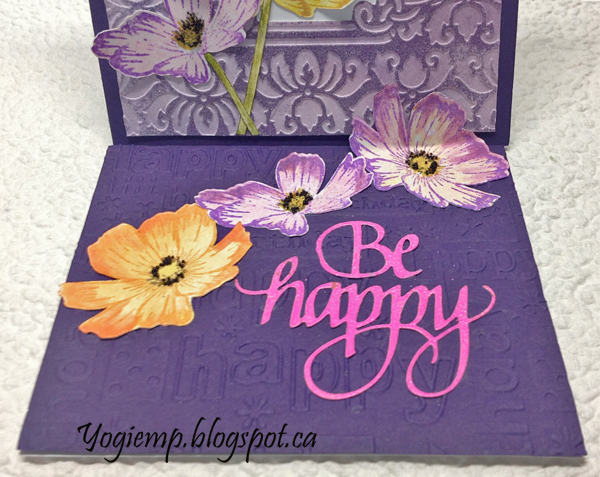 On the floor: Embossed another piece of white cardstock using the Cuttlebug "Happy Birthday" folder on purple cardstock, trimmed down and adhered to a piece of mat board then onto my floor to act as my stopper. 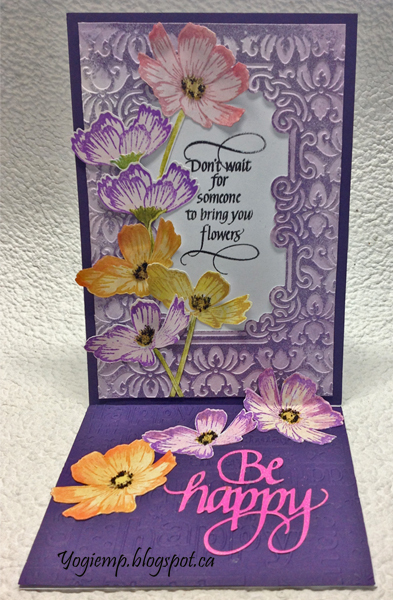 Die cut the "Be Happy" from a pink cardstock, inked with Versamark and embossed with a pink embossing powder.